I was out for a run yesterday and listening to an episode of CBC Spark in which they were discussing text-based games. And I suddenly had a flashback moment to my childhood. 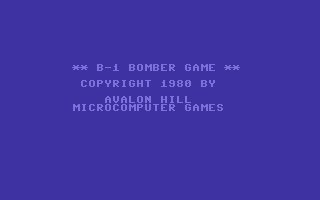 Tell me if this sounds familiar: You log onto your Commodore 64 or Vic 20 or Apple II and load up B-1 Nuclear Bomber. See the command prompt at the bottom? By inputting those 2-letter codes, you would trigger actions in the game. The system would run the process and then respond with an updated status and another command prompt. That was the entire source of interaction. 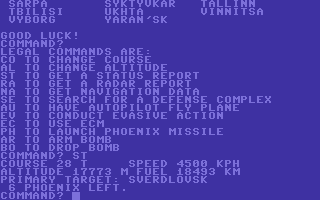 The entire game was text-based. Not a single image. The keyboard was your joystick. The best part? Our computer was so slow, that sometimes it would take hours to update the status. Hours. Like, we'd sit down to dinner and when we were done, the game was still processing the last action. But B-1 Nuclear Bomber was my brother's favourite (only?) computer game. I was only 8 or 9 when he got it and I used to hang out with him when he played it. I never did try playing the game myself. I do however remember it vividly, as if I was sitting next to the computer in the dining room of our home. (My parents got the whole "computers should be in a common area so we can monitor usage" thing very early.) Something about it seemed a little too complicated, a little beyond me. Just a little too out of reach for my 8-year-old brain. The strategy, the story lines, the typing... it was all a little much to grasp for a kid whose entire gaming experience up to that point had been playing Pong on my neighbour's old Atari a couple of times. But it was my first game spectating experience. And it's an indelible part of my personal tech history. One I haven't revisited in a very long time but which truly made me smile when I thought of it today. And it got me thinking about just how much gaming has changed since back then. I showed the Dude these screen shots and explained the game to him; he called it "Epic!" I wonder which of his games might prompt him with the same nostalgia when he's older? Minecraft? Portal? Time will tell.